We can perform the entire dental implant procedure, from start to finish, in our office. Missing teeth can not only be embarrassing. They can also affect your ability to enjoy your favorite foods and lead to changes in your bone structure if left untreated. Dental implants look, feel, and act as a natural replacements for missing teeth. They look much more lifelike than conventional bridges or dentures and can last a lifetime. Additionally, with dental implants, you can chew anything you want. 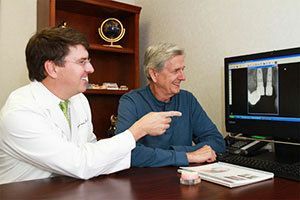 Our doctors offer several dental implant options at our practice in Mobile, AL, to suit your number of missing teeth, budget, and desired outcomes. Implants are placed directly in your jawbone for natural-looking, long-lasting results. A dental implant is a prosthetic replacement for a missing tooth. The implant is made up of a crown and root, just like a natural tooth. Most implant roots are made of titanium, which is a metal that’s particularly suited for integration into the jaw bone. Our doctors have special training in implant placement and will handle your tooth replacement needs smoothly and efficiently. 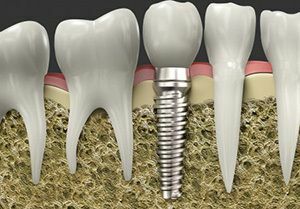 Implants are viewed by the dental community as the Gold Standard in long-term tooth replacement. Our dentists have experience in implant placement and use the latest equipment and techniques to optimize results. And here at Maitre & Crabtree Dental – unlike at many other dental practices – you can get the whole procedure done in our office! Previously, too little bone would prevent people from having implants placed. Now, we have better bone grafting techniques to augment insufficient bone due to gum disease or missing teeth. Research estimates that 25 percent of bone loss occurs in the first year and continues on. Implants act as natural teeth in maintaining jawbone. It also used to be that patients who were smokers or had certain health conditions, like diabetes, were considered too high of a risk for implants. Thanks to advancements in the science of dental implants, patients with these conditions can now be treated safely and effectively. Our staff can also review our financing options with you during this time. Dental implants are designed to integrate into your jawbone just like natural tooth roots. They are usually made of strong and durable titanium, and can even outlast natural teeth! Dental implants have become more and more popular over the last decade. Today they are considered by dentists worldwide as the “gold standard” in tooth replacement. Dentures have to be removed every day for cleaning. Implants are just like real teeth and are cared for the same way. Dentures often have a clicking sound while the person is eating. There is no such trouble with implants. Dentures can slip out during eating or speaking, while implants are anchored and permit you to eat and speak with confidence. Dentures are fairly bulky and cover the roof of the mouth (palate). Implants are anchored into your jaw and there is nothing covering your palate. Dentures are unstable and can move during chewing. They are also incapable of allowing for the same chewing forces as natural teeth. Denture users are forced to restrict their diet and since they may end up avoiding solid food like fruits, vegetables and meats, their health can be compromised. Implants let you eat anything you want just like with real teeth. Probably the most serious issue with dentures, and leaving teeth un-replaced, is bone loss.Teeth and their chewing action are an integral part of the health of the jawbone. When a tooth is lost, the supporting bone loses its stimulation and proceeds to decrease in density and volume. Research estimates that 25 percent of bone loss occurs in the first year and continues on. Implants act as natural teeth in maintaining jawbone. Bone loss affects facial aesthetics. The facial height between the tip of the nose and chin can decrease causing dramatic facial changes. These include pronounced wrinkles around the mouth, thinning lips, dropping curvature of the lips and sagging facial skin. These changes happen with age but are vastly sped up in the case of bone loss. We offer various types of dentures to suit your level of tooth loss and budget. With dental implants, your mouth will be restored as closely as possible to its natural state. In order to support a dental bridge, the natural teeth need to be ground down and a crown placed. This can weaken the teeth and make them more sensitive and likely to decay. This is not the case with dental implants. With a dental implant, there is no necessity to touch healthy adjacent teeth. A dental implant, like a natural tooth, preserves jawbone. Bridges tend to have a shorter lifespan than dental implants. Bridges can be expected to last, on average, 10 to 12 years with good oral hygiene and regular checkups. Dental implants, however, cared for properly (like natural teeth) can potentially last a lifetime. During your consultation, our doctors will help you decide which restoration is right for you. Do not let missing teeth continue to affect your diet, social life, and self-confidence. We have many tooth replacement options available and can complete most treatments all under one roof. 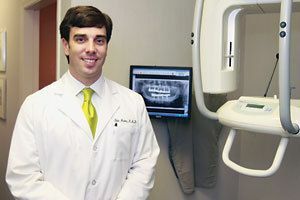 To make an appointment, call (251) 333-7234 or request an appointment online by messaging our team.